Lately my sleep has been crap (re: I'm not getting any shut eye) and as a result my brain has been absolute mush. I also have yet another sinus infection which has me feeling drained and grumpy. Man, I'm just a bag full of fun! Because of all this I've been feeling a bit discombobulated. Most of the time I surprise myself when I can form actual sentences that make sense. Or, at least I think they make sense. ♥ My hands have been feeling a little off lately so I've eased up a bit on the knitting. Only a bit though. I've switched up my knitting style a few times in hopes of relieving the discomfort but wasn't successful with that until I discovered and tried the Portuguese knitting style. ♥ Originally, the first time I felt my hands start to tense up I switched over to Continental but after an hour my hands were worse off than when I had started. Apparently I like to hold my knitting with a death grip that exacerbates my hand pain. I honestly thought I would have to stop knitting for a while to let this episode of hand soreness pass. ♥ I searched the Internet for different ways to hold your knitting, or to at least minimize hand movement and pain and that's when I came across several videos and tutorials for the Portuguese style of knitting. This is also when I learned about Andrea Wong, who seems to be the expert on the subject. Shortly after trying my hand at Portuguese knitting I discovered that Andrea also has a brand new Craftsy class for this very method of knitting! I'm extremely tempted to sign up for it. ♥ I wanted to try out this style of knitting because I had read that it's good for those with arthritis and CTS. I was really surprised that I was able to get into a groove with this style not even half an hour into my first attempt. I had kept at and even after three days of knitting my hands were feeling fine! I didn't even wake up with numbness or swelling! From time to time I've gone back to my usual throwing style (my gauge with Portuguese knitting is really tight and not really ready to be interchangeable with my throwing, so any projects that were started in English knitting will have to stay that style. For now) and can tell immediately that my hands can only go for short spurts of time before they start to cramp up. I wasn't intending on changing my knitting style but if this keeps up, I just might have too! ♥ I don't know if Portuguese knitting is faster, but I do know that it's very easy to get the hang of. Even purling is super easy! Actually, I want to purl!! How crazy is that?!? I've even read that some knitters who knit Portuguese will knit their garter in all purl stitches, or if they are knitting in the round they'll knit the item inside out so that they can purl the entire piece, all because purling is just so darn easy! ♥ To practice, I've cast on a new pair of plain vanilla socks in which I'm not allowed to knit a single stitch in either English or Continental styles. Just straight up Portuguese. So fair it's been going swimmingly well. I'm quite pleased. ♥ While I'm not 100% cold sheep, I've been trying to be pretty mindful of what yarns I do buy and bring into the stash. So often I forget about all the beauties that are chilling out in my stash and why I bought them in the first place. I've been trying to make more effort to knit from stash and to finally get around to appreciating and knitting up the yarns that I used to be so obsessed with. ♥ Speaking of obsessing over yarn, I'm currently dying to get my hands on the newest Regia line called Pair-fect. I don't know why since the end product would result in pretty much what you would get from using leftovers of self-striping yarn and a solid. I also can't get over Regia's Arne & Carlos line either. I'm seriously sitting on my hands trying to not to buy every single skein there is of the Star Night colourway! I love it so! 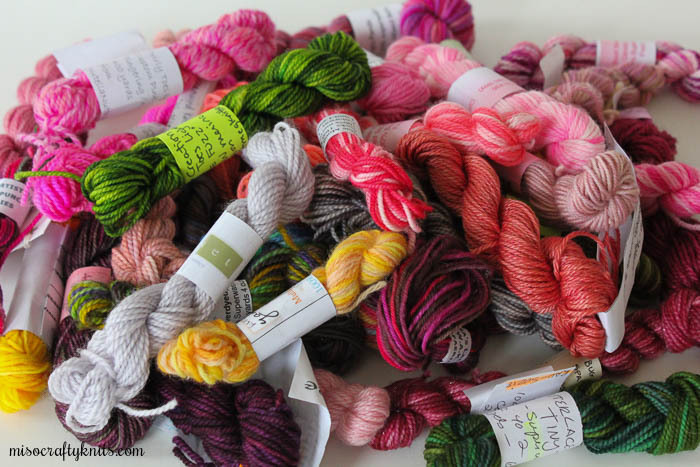 ♥ I'm extremely tempted to sign up for the Joji Fall KAL. I haven't participated in a KAL in ages, mainly because I always had other obligations and now it's the uncertainty as to whether or not if I can follow through and finish due to my CTS. I'm still a little hesitant but I've been wanting to knit a Lemongrass for years and now is the perfect time to get motivated and get knitting! ♥ I really shouldn't be casting on anything new though. I wrote a list of all the WIPs that are piled up high in a basket beside me on the desk (there's at least seven...I'm almost too scared to open up some of the project bags beside the basket!). I told myself, "you can't cast on anything else until you get through this list!". Not to mention that I would like to get all those needles back. ♥ A lot of those WIPs are socks. ♥ Maybe I should change that rule and say no more casting on socks. But sweaters are totally fine. After all, sweater weather is almost upon us. ♥ Nevermind. I just found two sweaters WIPs. ♥ I better stop looking for WIPs. PS - and yes, purling is faster than knitting in the portuguese style!! Sorry to hear that you suffer from such a condition! But glad to hear that you are still able to knit. Do you find that you are faster in a certain knitting style? I suffer badly from sinusitis and I take sinus tissue salts everyday. It stops your nose from blocking up and clears it all. Mine was so bad beforehand that I used to get dizzy spells and blood noses. I've been talking to my doctor and allergy specialist about my options. I'm glad to hear that you found a treatment that works for you. It's amazing just how much your sinuses can affect you. I've been lucky in that I haven't suffered from bloody noses, but can definitely feel your pain about those nasty dizzy spells! I don't want you to take this the wrong way, but I'm glad to hear that someone else has had this issue and I no longer feel like I'm being overly dramatic! What helps me with hands soreness is the regular stretching of the wrists and each finger. After a couple of weeks of everyday 10 min stretch the soreness never came back! I haven't heard of portuguese style, I'm so curious I find that it's always good to have a few different ways to knit, to help alleviate any repetitive strains. I'm totally going to check this out, thanks for the recommendation! I've had CTS for over a decade now & I work on a computer all day long. When my wrists are really bad, I use my splints, use Voltaren as needed for the pain & do contrast hydrotherapy which works wonders (link: http://www.larryswanson.com/2008/11/contrast-hydrotherapy-for-your-aching-wrists/). Sometimes I have to stop knitting but that hurts me more than my wrists! Good luck & hope you feel better soon. Hi Amanda! Thanks for the link, I'll definitely look into contrast hydrotherapy. I currently just ice my hands and wrists, and yes - always with the splints! Also thanks for giving me hope that knitting can still be accomplished when plagued with CTS. Knitting is my sanity saver, I have no idea what I would do if I couldn't ever knit again!